After months of court filings, pre-taped testimony and legal actions taken on their behalf, Sumner Redstone, his daughter Shari and Viacom chief executive Philippe Dauman are on the move. The 93-year-old mogul turned up at Paramount Pictures’ Hollywood lot last Friday, an individual familiar with the visit told TheWrap. Shari transported Sumner for a brief meeting with studio head Brad Grey, who left the confines of the executive suite to greet the Redstone family. It was the elder Redstone’s first public appearance in a year. After a brief exchange, Sumner went on to tour the grounds — the lot contains a building named for the mogul, which he owns through his control of Viacom parent National Amusements — while Shari and Grey continued discussions. The Hollywood Reporter first broke the news of the meeting. In another development Tuesday, Shari has been added to the guest list of Paul Allen’s annual power summit in Sun Valley, Idaho — one that already has Dauman listed to attend, an individual familiar with the list told TheWrap. That could be awkward because Dauman, Sumner Redstone’s longtime confidante, was just removed from a trust that will control his vast fortune if he dies or becomes incapacitated. Dauman contends in a lawsuit that Shari took advantage of her father’s poor health to orchestrate Dauman’s removal. The retreat, which brings together titans of industry and high-profile media figures, will feature the Viacom CEO and the woman who seems deeply tied to her father and his recent efforts to overhaul the business. In his still-active role as CEO to Paramount’s parent company, Dauman has made clear his intention to sell a minority stake in the legendary studio, despite the public battle raging between him and Shari. The Redstone Trust has made equally clear in statements that Sumner Redstone disapproves of the proposed sale. On Tuesday, Viacom Board of Trustees member Fred Salerno wrote a lengthy open letter about his distress over his lack of access to Sumner, and that the board fears that Shari and other medical advisors have too much control over him. May 27, 1923: Sumner Murray Rothstein (later Redstone; pictured) is born in Boston, and the media world will never be the same. 1979: Redstone (pictured) is badly burned in a hotel fire set by a disgruntled bus boy. Read more about the unbelievable details here. 1987: Redstone performs hostile takeover of media company Viacom, a stock that he'd been gobbling up. That same VIAB stock has had a rough 22 months lately -- read all about that here. 1993: Redstone's Viacom acquires film studio Paramount Pictures. This April, the aging figurehead publicly stated that he doesn't want to sell a minority stake in that company. The Viacom Board of Directors, on the other hand, is pushing for that to happen as early as end-of-June. 2000: Viacom and the so-called Tiffany Network, CBS, merge. It wouldn't last. Just five years later, Viacom and CBS split, though the two publicly traded companies are still under the same umbrella -- Redstone's National Amusements, Inc. still controls 80 percent of both companies today. 2006: Shortly after the spinning off, Sumner began feuding publicly with daughter Shari (the pair pictured together here) over her role within the companies. On September 5 of that year, Sumner Redstone taps legal counsel Philippe Dauman to lead Viacom. Shari Redstone and Dauman seemingly haven't gotten along since then, though she's apparently repaired the relationship with her ailing father. October 2015: Sumner Redstone's longtime girlfriend Manuela Herzer (pictured) was booted as his healthcare proxy, losing her sizable inheritance in the process. Dauman became Sumner Redstone's interim proxy, before Shari Redstone re-ingratiated herself and took the role over. Herzer would sue in May 2016 to get back in the inner circle -- or at least reclaim her spot in Sumner Redstone's will -- but was denied by a judge. Sumner's mental competency was held up at the same hearing, though it wouldn't be the last time an adversary asks someone sitting on the bench to double-check that. 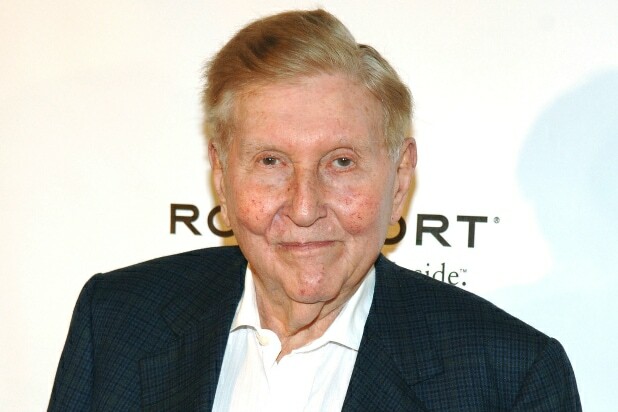 Jan 20, 2016: Activist investor SpringOwl calls for the Sumner Redstone (pictured, from 2012) to step down as Viacom and CBS chairman. The 92-year-old has had problems with his speech for years, and hasn't been able to so much as deliver a pre-written statement during quarterly investor calls. February 2016: CBS President and CEO Leslie Moonves' replaces Sumner Redstone as the broadcast channel's chairman on the third of the month. Sumner Redstone takes on the title of "Chairman Emeritus." A day later, Philippe Dauman (pictured, right, with Moonves, left, and Redstone, center) made the same exchange with Sumner Redstone at Viacom. May 18, 2016: The Viacom Board of Directors votes to stop paying Sumner Redstone (pictured at LACMA), a perceived slap in the face by his legal counsel. If you got a candid answer from someone at Viacom, however, they'd point out that the billionaire has plenty of money and does exactly zero work, so he's just fine. Plus, the company's been trying to cut costs where it can. May 20, 2016: Sumner Redstone (pictured here with daughter Shari) removes Philippe Dauman and George Abrams as trustees in the Sumner M. Redstone Trust, and as board members of his family business, National Amusements, Inc. This kicked off much public fighting between the two far-apart sides. The nastiest accusation came from Viacom and Dauman, who accused Shari Redstone of "manipulating" her father's signature. They're not the only people who believe the daughter is pulling daddy's puppet-strings. May 23, 2016: Philippe Dauman (pictured) and George Abrams (insert) sue in a Massachusetts court to overrule their oustings. Across the country, Sumner Redstone's attorneys ask a Los Angeles Court to affirm his competency, which would affirm the removals of Dauman and Abrams. 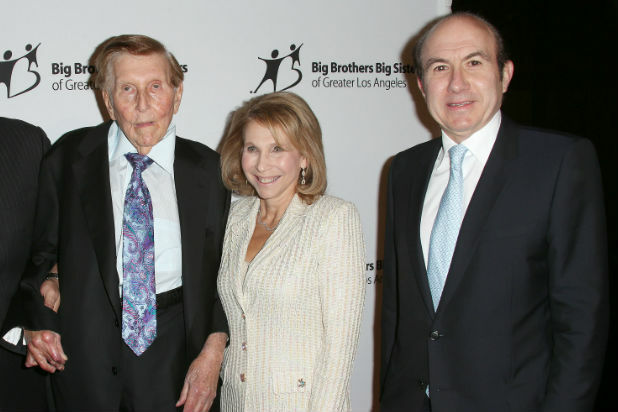 May 24, 2016: Sumner Redstone (pictured) replaces Philippe Dauman and George Abrams with his granddaughter Kimberlee Ostheimer and a pair of family friends, Tad Jankowski and Jill Krutick. August 18, 2016: Dauman is ousted from the company in a deal that also settles outstanding legal disputes. Robert Bakish is later named president and CEO of Viacom.